It can be quite hard and dangerous to communicate with fellow riders while on the road. This risk can even be higher when you are not sure of what you are doing. Avoid using cell phones to communicate while riding because it can lead into a tragic accident. Your hands should be holding the handle and not busy on the phone. The best Bluetooth motorcycle helmets is a safe way of keeping your hands on the motorbike while holding conversations with your companions. This is not an average helmet and this article will shed more light on this subject. Technology has been improving over time and motorcycle helmets have not been left behind. Modern-day bike-to-bike systems of communication are quite affordable and work pretty well. The market also has a broad range of helmet accessories such as earbuds and headphones that take advantage of the Bluetooth technology. The specific details and range of helmet accessories vary between units. However, the kits are universal and work on most open face, full face, and half helmets through adhesives or clamp-on systems. This is applicable when you have a helmet that you would like to add on a communication. Let us begin by looking at some of the best Bluetooth motorcycle helmets that are ready to go. The task of choosing the best Bluetooth motorcycle helmet can be a challenging one. However, I have taken time to review the top seven motorcycle helmets on the market. Each of these products will serve you with a very high level of convenience. One thing you need to understand is that each product has its set of strength and weaknesses. You need to analyze each of them to be able to make an educated decision. Match your needs with each of these products and identify the one that meets them with a high level of precision. The table below presents the best Bluetooth Motorcycle Helmets on the market. It gives a review of the specification of each product. We will be discussing more about each of these products in the preceding section. Be keen to understand the features, pros, and cons of each of these products before you come to a decision. This is one of the best full-face Bluetooth motorcycle helmets that you can find on the market. ILM Modular Flip-Up has been able to provide its users with something that they love so much. It is one of the long-range Bluetooth that is available for your use. According to the manufacturer, you can use this helmet over a range of one thousand feet. The goof thing is that ILM Modular Flip-Up lives to this promise. However, like any other product, it has its personal limitations like those that result from elevation changes and line-of-sight. Despite some of these constrains, the truth of the matter is that ILM is a rider-to-rider intercom system that is applicable over long distances. This equipment comes with an inbuilt Bluetooth 3.0 technology. As a user, the producer makes sure that you get maximum benefit from this helmet. The helmet also has adjustable vents that allow the user to control the ventilation system depending on the time requirements. The good thing with this helmet is that it will ensure the rider keeps his or her hands on the handle. The user achieves this objective through the one-touch control that makes the task of redialing and answering of calls an easy and doable one. Therefore, you will not strain with communication as you drive your motorcycle. In addition, the ability of this product to cancel echo and surprise noise gives you an assurance of an excellent sound quality. Wind and other road users can cause a lot of communication problems while riding but the ILM Modular Flip-Up produces one of the most satisfactory results. You can be sure of getting the value for your money by buying this Bluetooth motorcycle helmet. The Bilt Techno 2.0 is one of the safest Bluetooth motorcycle helmets. 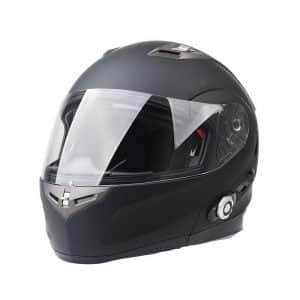 The equipment is ideal for individuals who are looking for low range helmets that have a high-quality delivery. This helmet will surely give you the value for your money. This helmet comes with a two-way intercom system. You can use this equipment to communicate with a passenger or other riders. The communication can take place up to 430 yards that is close to a square mile between riders and this is quite great. The universal intercom protocol is one of the best features of the Bilt Techno 2.0. The implication is that the communication system in this helmet is compatible with any Bluetooth device that you can find on the modern-day market. This feature alone qualifies it to rank among the best Bluetooth motorcycle helmets on the market. The inbuilt DWO-3 Bluetooth system enables riders to use this helmet to make phone calls while listening to music on their phone at the same time. This product also comes with a GPS system. 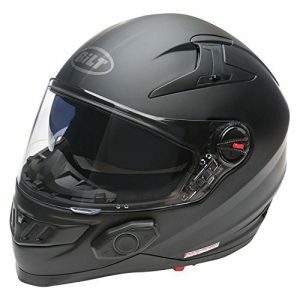 Bilt Techno 2.0 will not disappoint you if you are looking for high-quality helmets. The construction of this full-face helmet incudes polycarbonate which makes sure that the helmet will not overheat. You will be sure of a high level of comfort even when riding in the sunny summer afternoons. All riders are looking for helmets that have a perfect fit and the answer is with Bilt. The most important thing is to have a protective gear that is secure in its position. This helmet has a safety fastener that will assist you to achieve a high sense of security. Therefore, the helmet is not going to fly off in case there is an impact. Bilt also takes good care of the comfort that it gives to its users. The manufacturer uses high-quality materials to pad the inside section of this helmet to guarantee you maximum comfort while on the road. to add on this, there is an inclusion of a sun shield so that there is no vision impairment as a result of the scorching sunlight. 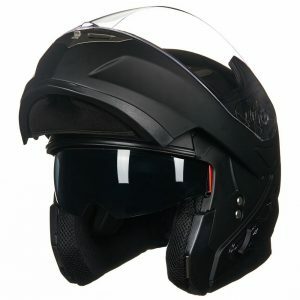 The helmet is light weight and hence comfortable even during the long journeys. FreedConn motorcycle is in deed one of the best Bluetooth motorcycle helmets on the market. The combination of its technical abilities and design makes this product to rank highly in the industry. This device has an inbuilt Bluetooth intercom system that enable users to take two individuals up to 500 meters away when driving. It is an excellent option if you will be on the road with several buddies. It is integrated with the Bluetooth 3.0 Technology. You can connect this helmet to your Smartphone and listen to your beautiful lyrics as you rise. The gadget will also give you direction from place calls and a mapping direction. The helmet has a single button that will allow you to take actions quickly. Some of them include listening to your FM radio, intercom with friends, and receiving calls. This makes everything quite easy while on the road. This product has a reinforced design that not only meets but also exceeds the government safety standards. It also has what the manufacturer refers to as the ‘lightweight shell’. The shell has an inbuilt ventilation to give your ride a high level of comfort. The helmet is affordable and will not be too heavy on the head of the rider. 3.0 universal Bluetooth connectivity makes sure you remain connected with GPS, cellphone, music player, and intercom simultaneously. Inbuilt Freed conn Bluetooth keeps you in touch with utmost two other riders. The first thing you will notice with the HJC CL-MAXBT II Bluetooth Modular Motorcycle Helmet is that it is very adaptable and comfortable. It is also available in many sizes to fit even kids. The face shield possesses an open position for allowing you outward visibility. It is also easy to replace after removal. The helmet has pockets on the ears for offering a seal from external noise while you are on the go. It also has an inner lining that is removable with thick pads which allow for a smooth feel at all times while with the helmet. This shield also provides maximum UV protection. This helmet fits well on all heads that have a diameter of sixty centimeters. 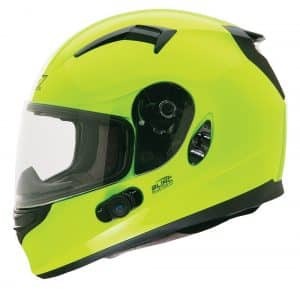 It is crucial to note that they have a flexible feeling that makes you feel like having so much space on the sides while the hinged visor has locks. When using the best modular helmet, you will realize that its horizontal visibility is perfect. In case the helmet is not of prime quality, it will be hard to get a good seal to surround the eyes. 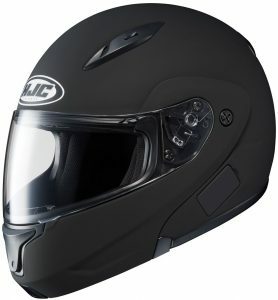 However, HJC CL-MAXBT II Bluetooth Modular Motorcycle Helmets have the credit of design with a case that fits well with its mask curvature to match the helmet. Additionally, the removal system of the shield is also easy to use. Sena happily licenses its product to the other helmet manufacturers on the market. 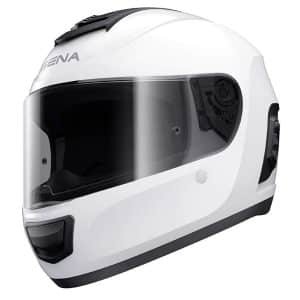 The Sena Momentum is a fully functional Bluetooth Helmet from this brand. This is a high-quality helmet that offers some of the best Bluetooth technology in the industry. All of this is enfolded in a single usable package. The device is a bit costly in comparison to other Bluetooth helmets on the market. However, the deal is worth the cost because of the service it delivers to the users. The helmet is constructed from fiberglass composite shell and multi-density EPS liner. These materials give the users solid protection from abrasions and impacts. The helmet also has sufficient air-flow, cushioning, and is an impressive product in its own right. The gadget is fully DOT and ECE certified. The equipment is equipped with the Sena 20S Bluetooth system underneath. It also has integrated speakers and microphones. The fact that it has no clip-on parts and wires guarantees you a hassle-free experience. The 20S enables riders to communicate through their cellphones, listen to music, connect with the other Bluetooth enabled riders, and tune to the FM radio. In addition, the device connects to the Siri and hence you can get updated information about anything that comes across your mind. Sena Momentum is armed with Bluetooth 4.1 with a maximum functional range of close to 1600 meters. This makes it one of the best Bluetooth motorcycle helmets you can get. The device offers crystal clear audio quality and easy connectivity. You could be familiar with this game as it is well-known for the funky image and flashy ads that it has. Apart from carrying this legacy forward, this product also adds high-quality performance to the mix. Talking about its level of responsiveness, this is one of the best Bluetooth motorcycle helmets on the market. We have very few products that can match the performance of O’Neal Commander Bluetooth Helmet. This helmet has Bluetooth 2.0 technology. This integration enables the helmet to provide 10 hours of talking time alongside 130 standby hours to users. Therefore, you can cover quite a long distance before you recharge the product. The helmet also gets it down to the tee when you think about offering a high range. It has a 118-foot range that supports communication between riders and this has lauded their customers. You can still use the Bluetooth technology to listen to music, navigate, and even answer calls. The designer of this helmet knows that customers desire to get style and aesthetics in the accessories they purchase and the protective gear has not been left behind. This helmet has been successful when it comes to giving users a stylish look. It has an excellent combination of black and yellow exteriors. It also features an anti-scratch material to guarantee you that this pleasing aesthetics will last you long enough. There is an inclusion of the dropdown sun visor in this product. The primary reason for this inclusion is to enhance the level of comfort to users. Once you add this to the cheek pads and removable liner, you will end up feeling as cozy as possible. The ventilation needs improvement because it gets foggy at some times. Riding enthusiasts will tell you that this is the best modular Bluetooth helmet on the market. IV2 offers a non-compulsory Bluetooth integration system, a receiver, and a helmet mic. This protective gear gives all motorbike riders a holistic solution. The interior section of this helmet is one of the best on the market. The inside lining is just perfect in all manner. It does not matter whether you are looking for a soft padding or EPS impact absorption. IV2 just has everything that you are searching for. The helmet has a modular design and hence you can remove it with one hand. The inclusion of the push-button technology is another source of convenience. It serves riders who struggle with converting the closed face of the helmet in to the open face one. You can be sure of great visibility because of the inclusion of a visor together with a fog-resistant shield. In addition, the shield is scratch resistant and this enhances its longevity. This helmet supports the Bluetooth 3.0 technology. Therefore, you can simultaneously communicate with four other riders with a 1200 feet range. The truth of matter is that this distance is quite impressive. The other admirable feature is that even though most helmets have the ability to connect with only one phone, this unit can connect with two of them. The only drawback to this unit is that is that the Bluetooth technology is not preinstalled. The instructions are included but this is a responsibility that most people will want to avoid given chance. Inbuilt Bluetooth Headphone compartments for music/phone calls on the go. The helmet is a great protective gear because of the high-quality thermoplastic shell and the impact absorption technology. The helmet is quite heavy. As you shop around for your next Bluetooth motorcycle helmet, there are some interesting terms that you are going to come across. Some of them include ‘Bluetooth ready’ and ‘Integrated Bluetooth.’ It is important to understand the difference between these two concepts because they will guide your decision. The ‘Integrated Bluetooth’ system comes already installed in the helmet. This means that you are buying a helmet that already has a Bluetooth communication system with it. Most people like this option because it is hassle free. However, you should be willing to pay a bit higher for these helmets. You should not confuse this with the ‘Bluetooth ready’ helmets. They refer to regular motorcycle helmets that come fully equipped with a space and recess for the user to fit his or her personal, separate, Bluetooth communication system. Its an ideal option for individuals who already own a Bluetooth headset and wish to install it in another helmet. Therefore, you need to be keen with what you are buying so as to avoid making unnecessary mistakes. There are some important things you need to put into consideration when buying Bluetooth motorcycle helmets like any other product. The first thing you have to remember is that you are in the process of buying an important safety equipment. Therefore, the helmet should be in a position to perform its primary responsibility and this is offering protection while on the road. therefore, the helmet should fit well, be secure, and manufactured according to international standards. After deciding on the fit, the next step is to check on the ergonomics of the helmet. You need to reach and operate all the controls with a lot of ease. Avoid helmets that you cannot use at least half of its operations with a lot of ease. These are expensive helmets that have some form of technology in them. You have to make sure that it will keep the unwanted elements out. This equipment is installed with an electronic device and any water leakages can result into destruction. Shop for a helmet that is 100 percent waterproof if you want to be on the safe side. It’s wise to familiarize yourself with some of the best Bluetooth motorcycle helmets that are available before you go out shopping. This will give you some insights about what the market has to offer. You cannot ignore the idea of pricing while buying any product. You can avoid overspending by having a clear range of what you wish to spend on the product. However, the best Bluetooth motorcycle helmets will always cost higher than ordinary ones. The pricing is also determined by whether you will fit the Bluetooth system by yourself or it comes readily installed. You can save money by buying a separate motorcycle Bluetooth intercom as long as you have a compatible helmet. Most Bluetooth devices have a relatively small operation range. This is contrary to other communication devices like satellites and shortwave radios. Generally speaking, both the transmitting and receiving devices should be within a given range from the Bluetooth helmet for there to be clear communication. For instance, you should be close to your Smartphone if you are using it to listen to music. The same case is applicable if you are using the helmet to communicate with fellow cyclists. You need to establish the maximum communication range depending on how you will be using the Bluetooth helmet. The number of microwaves that Bluetooth devices emit is considered to be comparable or less than the one that an average phone emits. You can block the exposure to these waves by making sure that the Bluetooth device is installed on the outer section of your helmet. Its an excellent alternative to traditional phones that you always hold too close to the face. Most people who have a great concern about exposure to dangerous waves can choose to use Bluetooth helmets. However, these fears are unfounded if you happen to be using a mobile phone. Second Hand or New: Which is the Best Bluetooth Motorcycle Helmets? If you are operating on a tight budget, you can always buy second-hand Bluetooth helmets. However, make sure they are in a good condition and functioning properly. Apart from helping you to save money, you will have a few helmets before you make a final decision about the best new helmet to buy. Such an approach is good for beginners. However, we cannot run away from the fact that new products are always the best. The purchase price of these helmets may be more expensive but they will last you longer. Therefore, its wise to buy a new helmet if your budget allows. You will also get a warranty from the manufacturer for the new products. 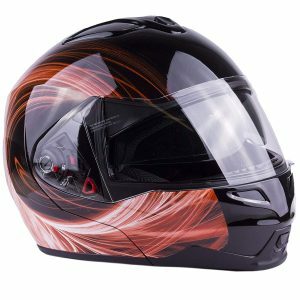 All said and done, its your obligation to get the best Bluetooth motorcycle helmets from what the market has to offer. It all depends on how you will be using the helmet and your personal preferences. Therefore, there is no one-size-fit-all helmet on the market. The most important thing is to use the power from the batteries to operate wirelessly. You will be able to communicate and listen to your favorite music without removing your hand on the handle. However, don’t forget the helmet is a protective gear. Choose the one that will give you maximum comfort and security while on the road in addition to clear communication.